Get your Hawaii insurance license using an America’s Professor online training course. Our comprehensive video lectures, review questions and study guide will help you learn, and retain, the material needed to pass your Hawaii insurance license exam the first time! I’m so glad a friend recommended your course! I really enjoyed it and it was easy to follow. I passed my test on the first try and want to thank you. I started studying w/ Exam FX, I was given all the study materials and had access online, but found that relevant information was either found in the reading or the videos, meaning I had to read the book and watch the videos in order to get all the information. What I like about America's Professor is that Jack walks you through each chapter, divides them into manageable chunks, tells you what to know and highlight, and explains concepts and terms to help you better understand the material. Although I was studying prior to America's Professor, Jack and his videos helped me to better understand everything within 5 days of studying. I can't thank you guys enough for the help. He wasn't lying when he said that although it may feel like I haven't learned anything, the knowledge would be embedded in my brain. Great teacher, great program. 5/5 would watch again. I'd done a lot of courses in the past that I didn't follow through with and that's mainly because other courses lack extensive detail. I really like this course because I feel that need to pay attention the entire time following along and Mr. Morton giving us examples the entire way through just makes it that much easier to understand. Granted there are times where i wish i could ask Mr. Morton a question but, its kinda impossible as I'm just watching the computer screen, but all in all this is by far the BEST online course I've ever taken. I passed my C/P test, and now I'm gonna be doing L/H. I'm excited to learn more about insurance and I know that this course is gonna bring such knowledge to myself. Thank you Mr. Morton again for this very detailed course! AP is the BEST! I love the structure of all the courses and video's. Professor Jack Morton was very good at explaining all the different policies and pretty fount at times :). I enjoyed taking all the practice tests because it helped me understand what I need to work on. Thank you Kindly AP and Professor Jack Morton! Darryl M.
This is an awesome company!!! I felt the study materials, quizzes, and tests were very challenging. So much, that the actual test was easy. Thank you, it was well worth it!! I enjoyed the Course and I would recommend it to anyone wanting a course that has an instructor that has very much insight into the subject. I passed my course!!! Now I'm on my way to a better future.. When it says their goal is to stay with you until you passed, AP did. Representatives were so quickly to respond to my questions. Don't think I would have FINALLY pass my exam. This is truly an excellent course!!! Professor Jack is a wonderful teacher, with a great sense of humor!! He makes the lectures fun & enjoyable!!! I passed both the Life and Health Insurance exams last week, and I had previously passed the Property and Casualty exams!! This is the only course I would recommend!!!! This course was great. Easy for those who are tired to read textbooks like me. I felt that I was taking a collage course. Also service was great. I had to skip study for a while for personal reason, and I requested extension. They did extend my days till I passed the test. Hope they will create other courses for all Hawaii insurance tests. This education course is highly recommended for anyone that is new to the insurance world like I am . The videos can be watched in the car while in traffic , lunch breaks or while laying in bed . And the best thing is you retain so much info because the speaker is funny and makes the topics relatable to you and everyday life . And the best part of this course is that they guarantee you to pass so if you only pass 3 out of the 4 test like me and your time for the course has expired they extend it for you and give the sections you need to re study so you do pass . 5 STARS!!!! Our goal is for your educational experience to be a positive one! If you are dissatisfied with your course, please let us know as soon as possible. We will make it right. If you start the course and realize it’s just not for you, let us know and return the materials and we will provide a full refund. If you are unable to pass the exam within your course subscription time please give us a call at 1-800-870-3130 and we will extend your subscription for free until you pass. If you fail your exam please send us a copy of your failed exam scores and we will provide study recommendations and support to help get you past your exam. We are committed to helping our students! Do we need to add a link? Please let us know! If you’re considering getting your insurance license in the Aloha State, you’ve come to the right place. America’s Professor has decades of experience helping students prepare for their insurance licensing exams—we’ll help you pass your exam faster than you can say humuhumunukunukuāpuaʻa. There’s no getting around it—you’ll need to know the material to pass your insurance licensing exam. Our courses are designed to provide with all the information you’ll need to pass your exam on the first try. Even better, our insurance exam prep courses make learning fun. Jack Morton, AP’s founder, has been at this a long time. He incorporates amusing stories and straightforward examples in his courses to help you make sense of complex insurance concepts and terminology. Prepare: Decide which license you want to obtain (e.g. Property & Casualty, Life, etc. ), and enroll in an exam prep course through America’s Professor. Our courses include 24/7 access to our streaming video courses for 45 days (with extensions at no charge, if needed), a hardcopy textbook that complements the videos, and our world-class customer service. Pass: Like all states, Hawaii requires you to be licensed to sell or even discuss insurance. You must pass the state licensing exam to start/expand your insurance career. Hawaii has its own laws and regulations pertaining to insurance products—that’s why there are two sections on the exam: a national section, and a state-specific section. Our courses prepare you for both parts. Apply: Once you’ve passed your exam there are a couple more things to do, including getting fingerprinted and formally applying for your license. Once you receive your actual license you can begin selling/discussing insurance! 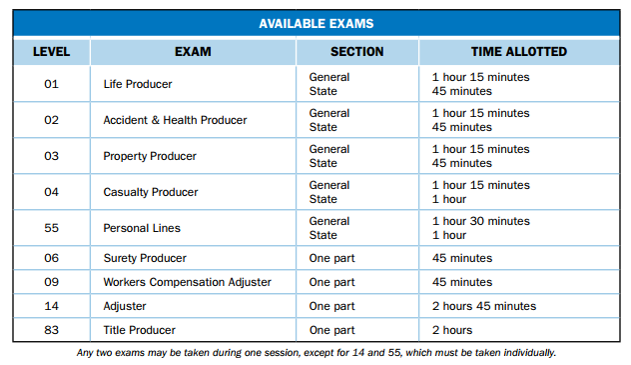 The state of Hawaii offers several different exams (see chart below). There are two parts to each exam: a national section and a state rules section. You must pass with a score of 75 on each part—the two scores are not averaged. Test Registration: In Hawaii, Pearson VUE is the company that administers the insurance licensing exams. Call Pearson VUE at 1-800-274-2608 to schedule your exam date; we recommend calling at least 3 days in advance to ensure you get the test date of your choice. Testing Centers: There are several testing center locations on the islands, including in Hilo, Honolulu, Lihue, and Kahului; there are also testing centers on the mainland in California and Washington. See the “Where can I take the Hawaii insurance exam?” section of this page to see all testing center locations. Fingerprinting: The state of Hawaii requires you to get fingerprinted as part of the insurance licensing process. Call Fieldprint at 877-614-4364 to schedule a fingerprinting appointment. Licensing Application Fees: You must officially apply for your license through the Department of Commerce and Consumer Affairs (DCCA) Insurance Division. There is a license application fee, which varies depending on the type of license. Learn more here.